According to employment law in the UK, gross misconduct is defined as an act, which is so serious that it results in a pay in lieu of notice or dismissal without notice (such dismissals without notice are often called ‘summary dismissal’). Furthermore, all such acts are capable of destroying the relationship of confidence and trust between the employee and the employer, thus making it impossible for the working relationship to continue. Having said this, many employers erroneously believe that “summarily” implies that you can fire an employee on the spot. In reality, however, they still need to follow a fair procedure before terminating an employee. Otherwise, UK employment law entitles the aforementioned employee to file a claim of unfair dismissal against the employer. What Qualifies as Gross Misconduct? First and foremost, the employers need to provide a clear indication of the type of behaviour, which may qualify as gross misconduct, to their employees. This information can either be published in the contract of employment or the staff handbook. It is important here that employers identify all such behaviour in advance, as it will help them demonstrate the ‘seriousness’ of the act later to the employee and an employment tribunal. or setting up a competing business. These may all qualify as acts of gross misconduct. Overall, it helps to have policies that cover any or all of these activities. On the other hand, lesser offences (usually relating to work performance) like poor timekeeping, use of workplace facilities, absenteeism, personal appearance or negligence, do not amount to gross misconduct. However, your employer may specify that repeated incidents of even minor misconducts (for example, absenteeism) can amount to a more serious offence cumulatively. By having specific examples of acts that qualify as gross misconduct in their disciplinary policies, employers do have a better chance of defending an employment tribunal claim brought against them. Falsifying accounts, self-certification forms or time-recording forms. All such acts usually incur significant costs for employers, in addition to damaging their relationship with their clients or service users. Such misbehaviour may occur between colleagues, between a customer and a worker, or anyone else that present in the workplace. Either way, any form of offensive behaviour can have a huge impact on the health, performance, morale, and confidence of the employees. Buying or selling drugs on the employer’s premises. Being under the influence of alcohol or drugs may cause lower productivity, absences, and culminate in accidents, which put both employees’ and their colleagues at risk. Reckless driving on and off the work site. When employees commit such severe breaches of health and safety rules, this often results in significant liability and reputational damage for employers. This can include acts of willful or deliberate damage to office property or gross negligence, which may culminate in a substantial damage or loss to property. The employer must demonstrate that the dismissal falls within the “range of reasonable responses”. 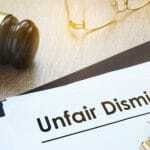 In case, the tribunal believes that there was no justification for the employer to terminate the employment, it may consider the act as unfair dismissal. NB – It is important to know here that only the employees with at least two years of continuous service with the employer may submit a claim to a Tribunal against unfair dismissal.